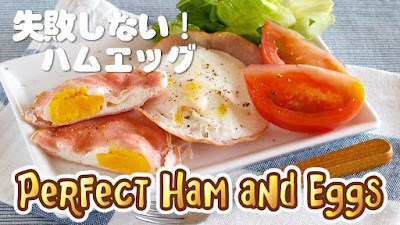 If you make ham and eggs in a Microwave (if you know the exact minutes you want to cook), you can make perfect ham and eggs without fail (burning black)!!! 1. Put 1 tsp. of water in a microwavable dish. 2. Place a slice of ham, place an egg, prick some holes in the egg yolk with a pick or a fork (to avoid exploding), then place another slice of ham. 3. Cover with plastic wrap or a microwavable lid, and cook at 500W for a minute and a half. *You want to adjust and find the cooking time of your preference. You can make it without a ham on top, or make a simple sunny-side up using this technique.